Megaplumes are massive three-dimensional cells of seawater that exhibit elevated heat and chemicals properties. They are generated by the sudden expulsion of super-heated and chemically charged seawater from geographically extensive and volcanically active deep-ocean regions such as major tectonic plate boundaries or upper mantle hotspots (Figure 1). The affected ocean region exhibits increased temperatures, altered chemical composition, modified currents, and increased turbulence, all of which act to vertically mix portions of the water column. One example is the 1998 El Nino, which had a significant affect on the climate worldwide. 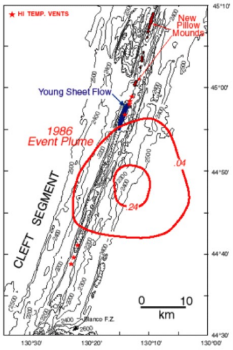 This 1998 megaplume originated from a deep-ocean region east of Papua New Guinea that is known to be volcanically active and associated with several major plate boundaries. The history of how megaplumes were discovered, researched, and then more or less ignored, however, is an interesting story itself. It went something like this: In 1986, scientists identified a massive cell of unusually hot and chemically charged seawater off the coast of Washington state. Baker et al discovered this phenomenon near the Juan de Fuca Ridge, and it was the first cataclysmic hydrothermal vent or megaplume. The discovery shocked oceanographers and geologists for several reasons. First, it was of unprecedented size: 20 miles wide and 3,300 feet tall. Even more amazing, ocean temperature buoys showed that this entire cell was created in just 48 hours (Figure 2). It was stunning to witness this amount of energy released in such a short time period. Extensive follow-up research proved that this megaplume was generated by the rapid expulsion of superheated and chemically charged water from a major deep-ocean geological feature, the Juan de Fuca Ridge. This pull-a-part fault complex is a portion of the plate boundary between the North American Continent and the Pacific Ocean Plate. Baker was particularly interested in learning more about megaplumes, observed only seven times before. Hot geysers of water, such as those on Axial’s flanks, rise only a few hundred feet above the seafloor, then diffuse like a pall of low-hanging smoke. Megaplumes, however, can soar more than several thousand feet off the ocean floor and spin like slow but gargantuan tornadoes. They can be 12 miles across and travel hundreds of miles. “It’s a bomblike event,” says Baker, who was among a group of oceanographers who discovered the phenomenon in 1986. Shortly thereafter, the researchers dubbed the underwater cyclones megaplumes. Second, megaplumes stir up huge amounts of ocean, carrying minerals and gases and heat almost to the sea’s surface. Vertical mixing doesn’t happen easily in the ocean. Cool, dense water tends to stay near the bottom and warmer buoyant water near the top. As they rise from the ocean’s depths, megaplumes may bring energy and food to animals in shallow water. “They could be doing things to the energy of the ocean that we don’t even know about,” says David Butterfield, a chemist at the marine environmental lab. Also during this time period (1983), the National Oceanic and Atmospheric Administration (NOAA) developed an entire group, the VENTS Program, to research hydrothermal vents. The group was largely composed and directed by oceanographers and geologists. They realized that earth’s oceans were not static pools of seawater; to the contrary, they now understood that the oceans were very dynamic, powerful and ever-changing systems much like the atmosphere. Additionally, they understood that geological forces played an important role in driving ocean dynamics and as a result likely affecting climate patterns. How much influence these geological forces had on ocean dynamics would have to be resolved with future research. As research by the VENTS and other groups progressed, even larger megaplumes were identified, for instance in the Indian and Atlantic oceans. These plumes were immense: 44 miles by 20 miles by 5,000 feet tall. Calculations of total energy release per megaplume were astounding, clearly enough energy to significantly effect ocean dynamics. Eventually researchers identified a worldwide network of hydrothermal vents, mantle hotspots, and megaplume generation locations. Many of these features were associated with active tectonic plate boundaries or upper mantle hotspots. At this point scientists were beginning to get a handle on the effect geological forces have on the ocean, and as a result the climate. Atmospherically trained climate scientists proposed the theory of man-made global warming. Seemingly overnight, these scientists had waylaid further investigation into the megaplumes’ effect on the climate. Bolstered by environmental groups and fear-mongering tactics, climate scientists discarded years of sound geological research and its influence on the climate and replaced it with a new “consensus” theory: Namely, the climate could only be affected by man’s influence on the atmosphere. By default, geological forces were relegated to a minor secondary role in the great climate change debate. Atmospheric-based solutions for all climate patterns and climate-related events were force-fitted into this shiny new man-made global warming theory. This force-fitting process worked well for a while, until it became apparent that not all climate events and pattern variations could be ascribed to the atmosphere. Slowly at first, then more quickly during the last few years, climate scientists have started to “reinvent the wheel” so to speak. New and much more accurate data that demonstrates geological forces, including megaplumes, play far greater roles in altering the oceans and our climate is simply discarded. A new theory, Plate Climatology, first proposed here, has emerged as the best explanation for the relationship between geological forces and climate. Credible evidence increasingly supports plate climatology theory, which states that geological forces influence El Niños, Arctic sea ice melt patterns, hydrothermal methane and CO2 emission rates, deep-ocean currents, coral reef bleaching, plankton blooms, mega-droughts, and so on. The discovery of geologically induced megaplumes played an important historical role in the evolution of climate science. To the satisfaction of field geologists, that notion is currently experiencing a resurrection.